Framing your art can be a daunting endeavor to new artists, but it’s worth it. The result is a profoundly impactful piece of work that stands out in a way it couldn’t without custom framing and matting. But what’s matting and how does it work? The mat board you choose should be dictated by the artwork you are framing. The matting should enhance the colors and features of your artwork without overpowering the piece itself. The best matting should serve to protect your artwork from harmful elements and help it last a lifetime. Picture matting is meant to do several things for your artwork. Perhaps the most important feature of matting though is the space it creates between your artwork and the surface of the frame. The added space prevents the artwork from adhering to the glass surface and allows it to breathe within the frame, preventing the accumulation of moisture inside the glass which can lead to the damaging growth of mold. The mat board is also meant to enhance your artwork by drawing out certain colors with the addition of a colored or contrasting mat board. The effects of matting vary depending on the piece of artwork. White space can be complemented with double matting or black matting, while certain pieces of work only need a thin matting to add a professional, polished look. Look around online for some examples of picture matting if you need some inspiration. The final reason matting is used in custom framing is to hide the mechanics going on behind the picture that allows it to hang within the frame, like hinging or dry mounting. Tapes, hinges, and other mechanical parts of the frame are concealed behind the matting so as not to distract the eye away from the art itself. 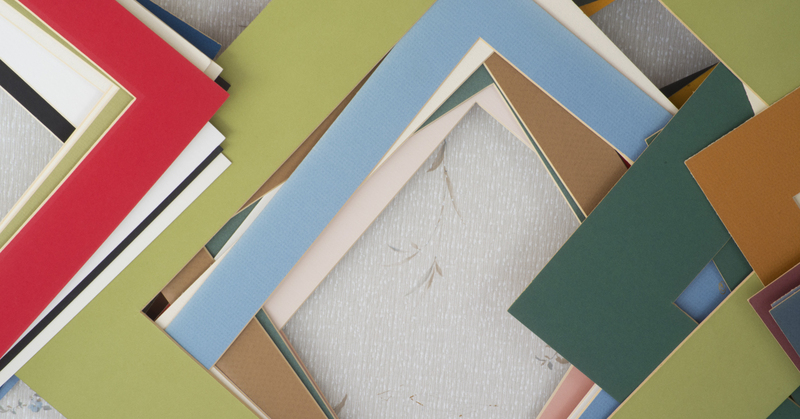 There are plenty of types of matting that can be used for custom framing. However, you are encouraged to use preservation grade materials to protect your artwork from the damaging effects of mat board and prevent the gradual degradation of the matting within the frame over time. The two best options instead of a regular paper mat are alpha cellulose mats and rag mats. Both are preservation quality and won’t fade over time or harm your artwork. There is a third option for matting material that gives artwork an elegant and professional appearance within the frame, fabric mat. Although there are many different fabrics to choose from, very few are actually preservation quality, and unfortunately, many of them don’t stand the test of time. Certain brands manufacture fabric matting that is of preservation quality, but there’s a significant price jump compared to other matting materials. There are all kinds of options available to artists when it comes to matting and framing selection. The best way to familiarize yourself would be to stop by Jerry’s Artarama’s framing department and inspect the different options available to you. Bring your work and ask the professional framers behind the counter what they would use to frame your piece. Don’t be afraid to ask questions to learn more about the effects of matting on artwork, custom framers are valuable sources of information when it comes to presenting your art and will be more than willing to share their opinions with you.